There’s a certain kind of restaurant decor that lets you know that the restaurant is really part of the community, run by people who are invested in the success of the people who eat there. Pierce’s Country Cooking (610 W. Fairview Ave.) embodies this kind of aesthetic, where every square inch of wall space is devoted to college athletic team schedules, or maybe an autographed celebrity photo or jersey or two. A number of places try to replicate this scheme, like how a big, corporate chain with no soul might scrounge around town looking for local memorabilia to give a bit of uniqueness to the kind of dining room that might otherwise be in an airport. But Applebee’s is faking it. Pierce’s, with a bunch of really cool ASU team posters, is the real thing … and the food is better than Applebee’s too. 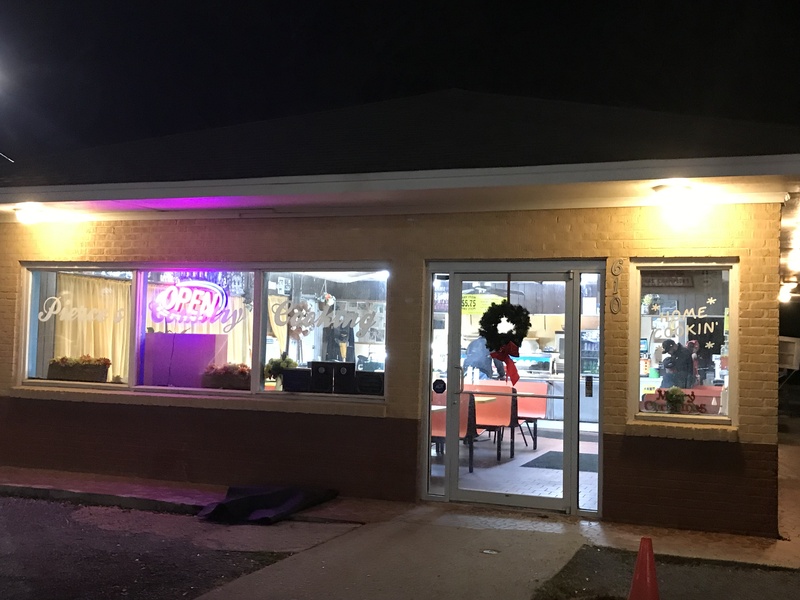 We made our first-ever trip there on a recent rainy night and cruised down the serving line, selecting from the fairly standard “meat and three” types of options. 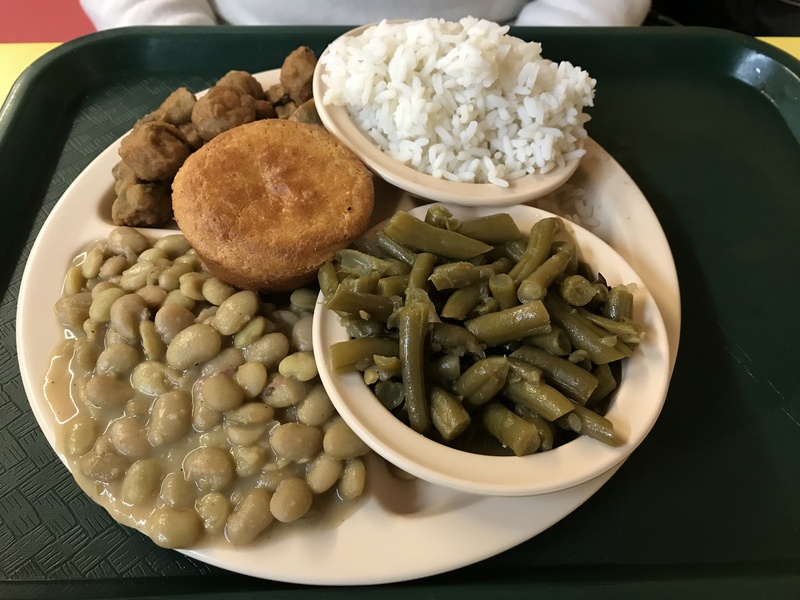 Readers who are familiar with our culinary tastes will be unsurprised that we passed up some likely delicious pork chops and chicken and meatloaf, and went for a pair of veggie plates that, while not exactly health food, were tremendously satisfying and filling. It’s possible that we should have mentioned this news in the first paragraph of the review, but it’s got to be noted here that the banana pudding was among the very best we’ve ever had. Too many places skimp on the bananas and overwhelm with whipped cream. Or some places will essentially boil the bananas down to a paste. Pierce’s has mastered the balance of the formula, and we both agreed that it would be worth putting in a special large order of the banana pudding the next time we have honored guests in town (or perhaps are just feeling celebratory or gluttonous). It’s also worth noting that while we were eating, someone came in and did exactly that with the cornbread. It’s a high compliment when someone will come in specifically for a special order of the cornbread. And, yes, the cornbread was also amazing. The atmosphere felt more like someone’s home than anything on busy West Fairview should have. The service was kind and attentive, without being intrusive, and we felt welcome and appreciated. But with banana pudding like that, we’d even go back and suffer some abuse if the result was a serving of that dessert. All in all, the marketplace for a notable meat and three can be tough to break into. It’s a crowded field, and one of our region’s very best culinary traditions. But Pierce’s, which has been around for many years, belongs in the mix, and we’ll be back for future meals. We highly recommend adding it to your rotation of options for dining out in Midtown. Please ask them to post a daily menu on their Facebook page.